Martin Doutré: good on you, Ulanda! The following are the words of Martin Doutré, a man who, along with Ross Baker, deserves a knighthood for the work he has done to enlighten truth-seeking New Zealanders. Ross and Martin’s dogged research has exposed many Treatygate scams. They, in tandem with fellow walking encyclopaedia Allan Titford, Allan’s once-supportive wife Sue, and others like Jean Jackson, have proved to the satisfaction of all reasonable observers (not including the corrupt Waitangi Tribunal) that the Te Roroa land claim on the Titford farm is false. For decades Ross, and more recently Martin, have spent a great deal of time with the Titford family, and got to know them all well. These are Martin’s thoughts on the predicament Ulanda now finds herself in. Essentially, Ulanda’s world got turned on its head when a bunch of conniving adults, from varied backgrounds and harbouring their own selfish motives, hatched a plan to take Allan Titford down. The primary instigators of this programme appear to have been government and grievance-industry-aligned outsiders, who had tried to nail Allan Titford to the wall for years, in retaliation (utu) for the embarrassment he continued to cause them with his all-too-well documented evidence. Some of this gaggle obviously included Crown Law, the Waitangi Tribunal, the police, Te Roroa opportunist thugs, The Treaty of Waitangi Information (propaganda) Unit and various members of parliament, whose dirty laundry had been hung out by Titford for all to see, etc., etc. A unique opportunity arose to exploit Susan’s disenchantment with the rigours of dairy farm life and a marriage that was turning sour. The evidence suggests that, bit by bit, she began to play ball behind the scenes with authorities hell-bent on destroying Allan Titford once and for all. What the authorities had failed miserably to accomplish in the public arena by fair and open means, they would accomplish via a domestic dispute sideshow and ad hominem attack that distracted public attention away from the true, outstanding issues. The Titford children obviously became mere pawns in a strategic game being played out at a high level by government corridor-creepers with political agendas, offering enticements (pie in the sky by and by) to those in the family willing to cooperate. It was, however, absolutely essential that there be solidarity, a singular focus and closed ranks by the entire group. Everyone had to toe the line or certain family heavies would need to intervene to browbeat or intimidate unbelievers and strays into compliant submission. Ulanda and others of the impressionable children fell victim to severe yell-you-down adult attacks, emotional blackmail and intimidation when they broke ranks and were no longer willing to be actors in the farcical pantomime being played out. Left: The Titford dairy farm home at Awanui was a pretty normal rough-and- tumble household that got a bit dishevelled, then cleaned up and organised on a daily basis. The cupboards were always overflowing with plenty of goodies, the lounge was often strewn with toys and, in this photo, Xmas cards from well-wishers hang from above the sliding doors leading out to the deck. Nice portraits of all the kids hung from the walls and, although the language between siblings was often colourful, everyone interacted reasonably well. Right: Flounder speared at the back of the farm by James and Ulanda sit in the kitchen sink before a fry-up. Left: Ulanda, in gumboots, gets down into a muddy ditch in preparation of getting a strop around a stranded cow before it gets gently pulled to safety by the tractor. Right: Shiane, Ulanda and Jesse horse around in one of Allan’s vintage cars before it’s put to bed in a shed. Left: Alyssa (background) and Ulanda (foreground) involved in the once-a-day, afternoon milking and training up the city-boy bystander on what to do. Right: Shiane, Jesse and Alyssa in the background and Ulanda sitting in the water at Ninety Mile Beach, not far from the farm, where they often went to recreate. The also swam regularly at the local lake and frequently dined out at Kaitaia. I was impressed that the kids were always well dressed, seemed to have all of the latest electronic gadgetry or toys, etc., and what I would have described as a nice environment to grow up in at and around the farm. Allan maintained a level of discipline that kept the children on the straight and narrow, which situation, once he was out of the picture (2.5 years after these pictures were taken), turned to custard. Some of the kids turned feral once they were beyond Allan’s jurisdiction. Adults such as Susan, as well as her father Graham and brother Richard turned a blind eye and blithely let the older girls be sexually exploited by live-in adult predators, a situation Allan would never have tolerated for an instant. If anything, Allan was perhaps over-protective and ever mindful of consequences, which might explain why in about 40 years of driving he never had one speeding or parking ticket. 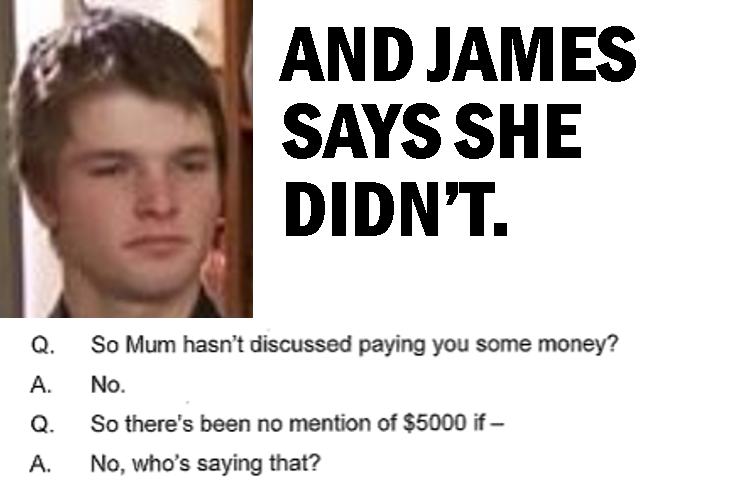 Alyssa and her boyfriend Tyler, as well as James, complained to me about the constant harassment they endured from Graham and Richard Cochrane, which caused them to flee the Hikurangi home and try to make a life for themselves elsewhere. Similarly, both Ulanda and Gene Hanham (an adult who had been permitted to sleep with 13 year old Ulanda and had impregnated her when she was only about 14 years of age) complained of the almost daily violence and abuse being handed down by Graham and Richard, which caused them to flee also. When they did finally fly the coop, however, the threats from Susan, Graham, Richard and Alyssa came in thick and fast, heavily laced with emotional blackmail to get them back into line. Gene Hanham had been threatened with a shot between his eyes or in the chest, and, according to dispossessed Northland farmer, Don Harrison, something akin to that did in fact happen, except with a non-lethal, gun-blasted, paper-wad projectile that, according to Don, is reported to have “hurt like hell”. 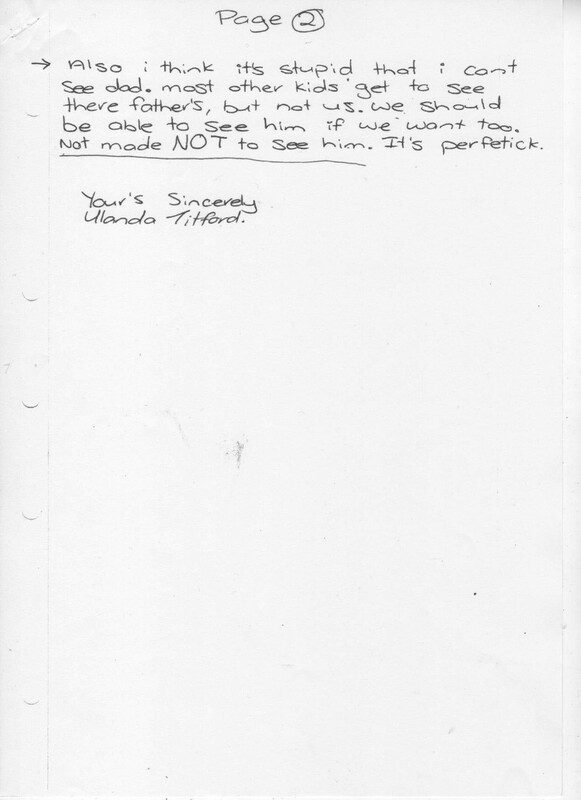 Thereafter, Gene Hanham apparently saw the world in a whole new light and wrote to Allan, threatening him that he was not to, under any circumstances, release any of the supportive statements Ulanda had sent to him. Isn’t it amazing what a near-death experience can do to an individual’s outlook on life, and how putting the fear of god into someone can bring about such a dramatic and spontaneous reappraisal of how they should conduct themselves? So, in summary, very young, impressionable and vulnerable Ulanda, for all of her good intentions and genuine sentiments in support of her father, didn’t have a snowball’s chance in hell of countering the many adult bullies that surrounded her, yelling her down and bludgeoning her into dutiful submission when she refused to participate in the let’s-all-hate-Dad game. In the end, even the father of her child, Gene, withdrew his support, seemingly in dread fear after having so recently confronted his own delicate grip on mortality. Despite your tender years and all of the intimidation or turmoil you were unfairly subjected to, you still had the courage of your convictions to speak out in defence of your much-maligned Dad. With all due consideration to your present situation or need to survive as a young mother and partner, trying to make a go of things, your former actions of speaking the truth when forbidden to do so, stand out as remarkable and courageous. I have great respect and admiration for you, as do others who read your words, for what you tried to do in such intimidating and difficult circumstances. Despite your heart-felt pleas, your Dad had the ultimate gag-order placed on him. If he contacted you in any way, even through a third party like me, it meant a serious breach of the trespass-order and immediate imprisonment … as he came to find out when he tried to help Alyssa in 2010. What you wanted or what your father wanted didn’t count, as others held all the power over you both. 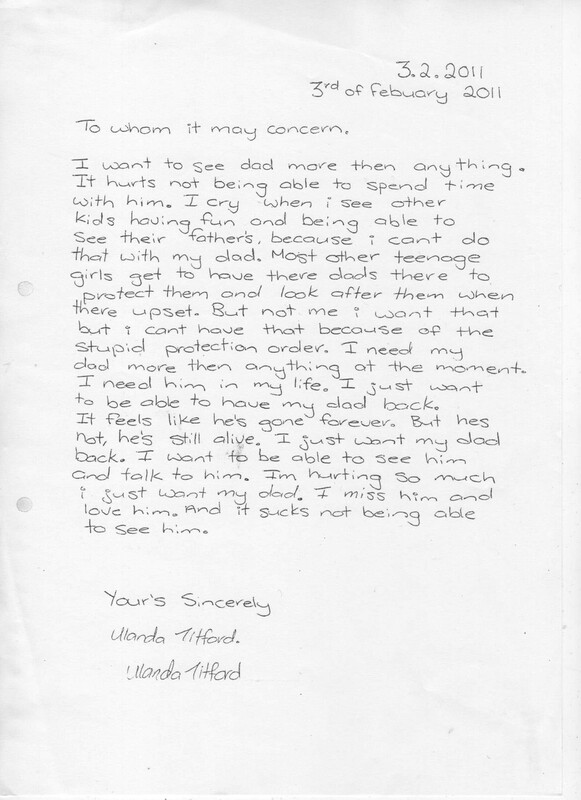 With some reluctance and sadness, I publish the following statements of a young Ulanda Titford, then aged 15. Martin Doutré tells me he knew Ulanda as a nice young girl, whom he is sure has recently been pressured by her mother and Sue’s violent family into switching her allegiance, in exchange for money and safety for herself, partner and baby. 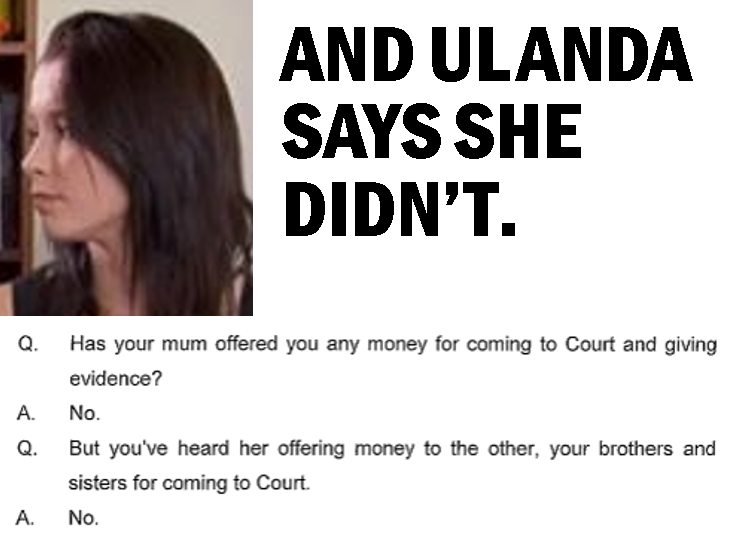 Sue says Ulanda was bribed to write the above. Even though Ulanda desperately wanted her dad in her life, Sue’s protection order banned Allan from making any contact with his children. 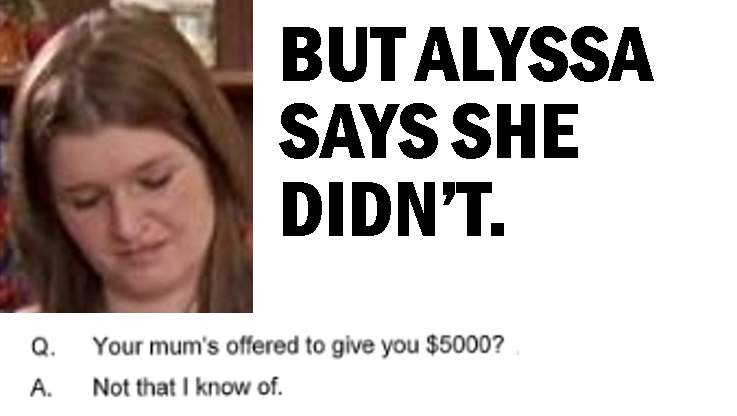 This cost him dearly when Martin Doutré told Allan that his daughter Alyssa was roaming around the countryside out of control while under Sue’s care (she and a boyfriend having just stolen Martin’s car). As a concerned dad, Allan decided to breach his protection order and ring Sue, and they had a long, amicable chat about the situation. Then Sue reported Allan to the police, and he was locked up for four months — until Martin’s testimony got him released. Amazingly, even if Allan had asked Martin to contact Alyssa — or Ulanda in the above case — Allan would still have been thrown in prison. The state has destroyed his relationship with his children, and Sue has been free to fill their heads with terrifying stories of Allan wanting to kill them. Ulanda, for one, clearly had no such concerns about him. 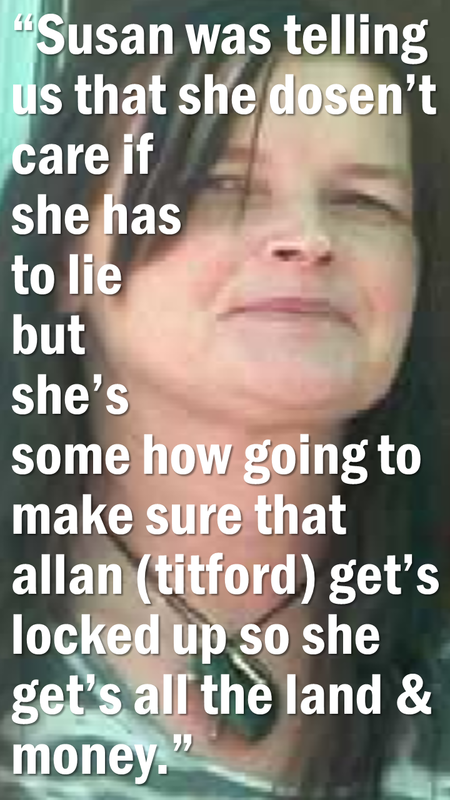 DEATHBED CONFESSION: SUE TITFORD’S DAD TORCHED MAUNGANUI BLUFF HOME – Sue, kids, police and Allan’s legal aid lawyer knew Allan was innocent, but let the court convict him. 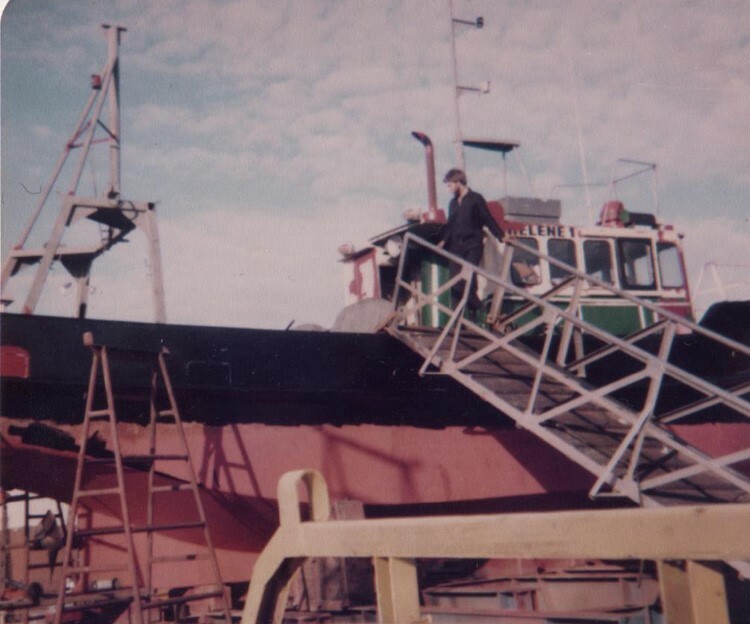 There has been a major breakthrough in the Allan Titford case. And sadly (but typically) every newspaper, TV channel and radio station in this country, in accord with the state’s wishes, is covering it up. 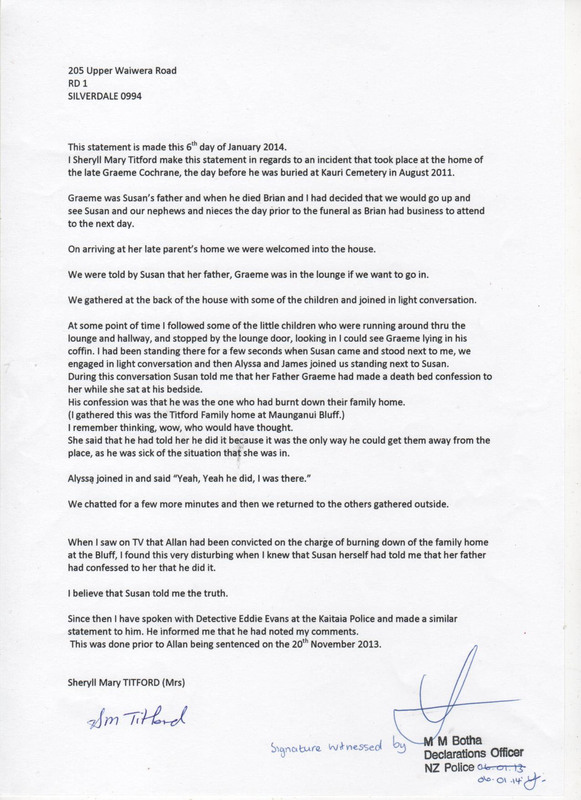 Before you read the affidavit below, bear in mind that the woman writing it, Sheryll Titford, along with her husband, Allan’s brother Brian, doesn’t like Allan. She has always supported her former sister-in-law, Susan Titford (Cochrane). This is what makes Sheryll Titford’s voluntary affidavit so remarkable. Despite being a friend of Sue’s, Sheryll has been moved by her conscience to do the right thing by Allan. 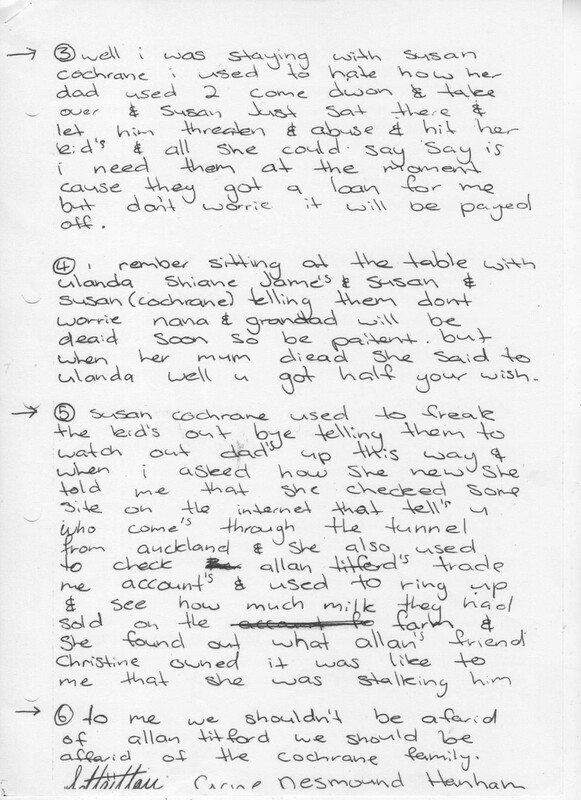 Sheryll’s affidavit reveals that Sue told her that her (Sue’s) father, Graham Cochrane, confessed on his deathbed to burning down Sue and Allan’s family home at Maunganui Bluff. Sue and Allan’s daughter Alyssa Titford witnessed Graham Cochrane’s confession. 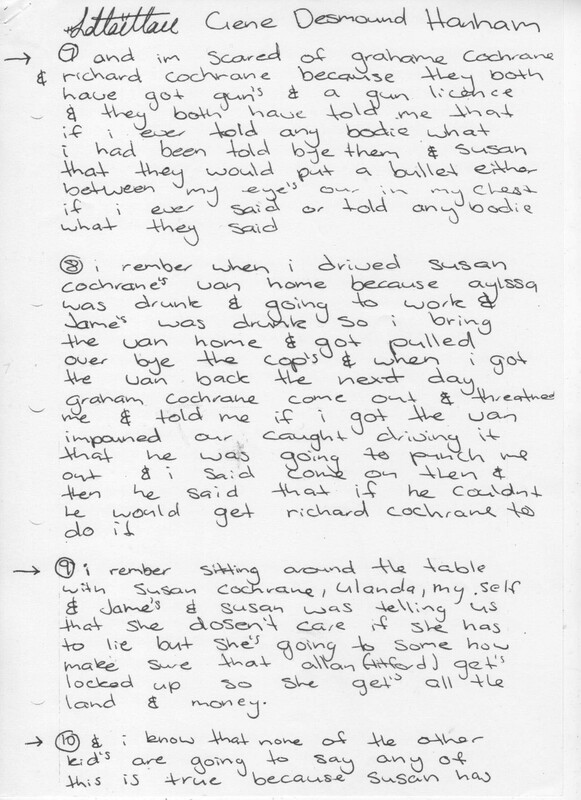 Sheryll gave all this information to the Kaitaia police, who had charged Allan Titford with the arson, and were in the middle of the trial trying to prove it. Allan’s aunt, Ileen McGrath, who had persuaded Sheryll to tell the police what she knew, gave the same information to Allan’s state-provided legal aid lawyer, John Moroney. And yet, despite Sue, Alyssa, the police and Allan’s government lawyer having information that Allan did not burn down his house, Sue testified in court — in great detail — that he did. 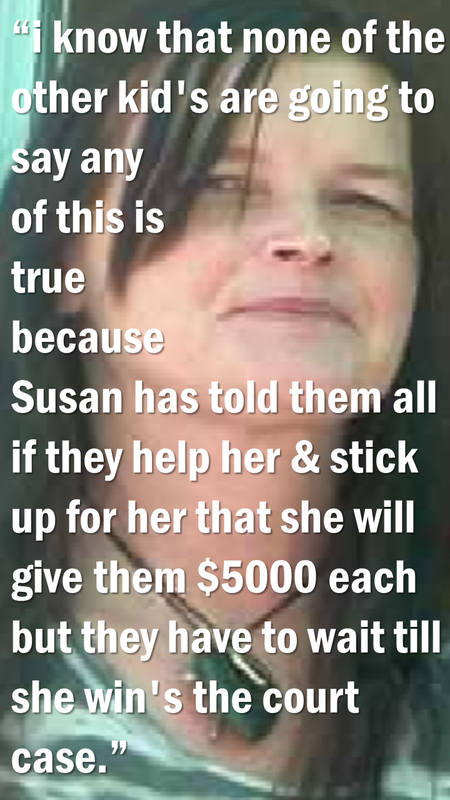 And the police said nothing and allowed Allan to be sentenced to 24 years imprisonment for this and many other charges, convicted solely on the evidence of Sue and her family and friends who stood to gain massively from stripping Allan of his money, property and liberty. And the lawyer, even more remarkably, made no mention of the new evidence in his client’s defence, having previously called precisely no witnesses for Allan despite being given several pages of names! confessed on his deathbed to burning down Sue and Allan’s house. Now follows another affidavit. 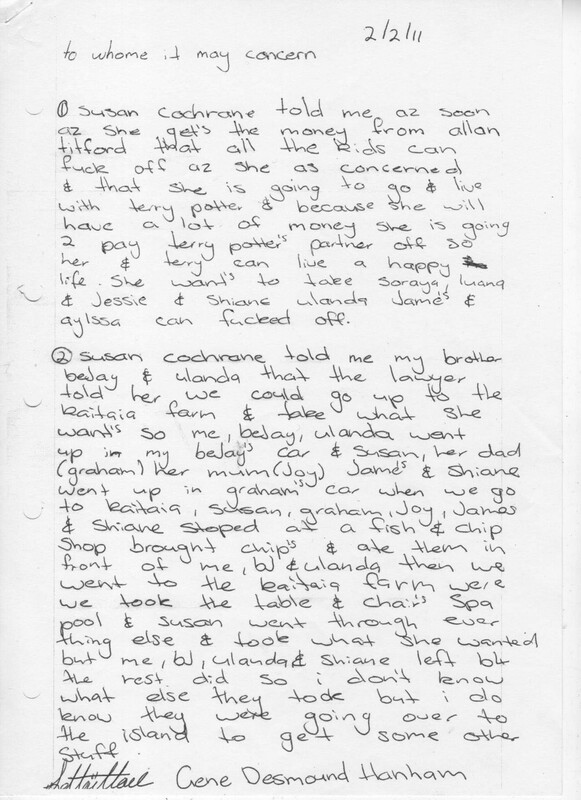 This one’s from Allan Titford’s aunt, Ileen McGrath, telling of how Sheryll told her about Sue’s revelation of her father’s confessioni. It also reveals that Sheryll gave this information to the firm acting for Allan — and yet Allan’s state-provided legal aid lawyer, John Moroney, did nothing to bring it to the attention of the judge before sentencing. Sheryll Titford and with Allan’s legal aid lawyer’s firm. Now finally a statement from Martin Doutré, the dogged researcher who had already formed the view that Graham Cochrane had committed the arson before a chat with Ileen McGrath confirmed his suspicion. 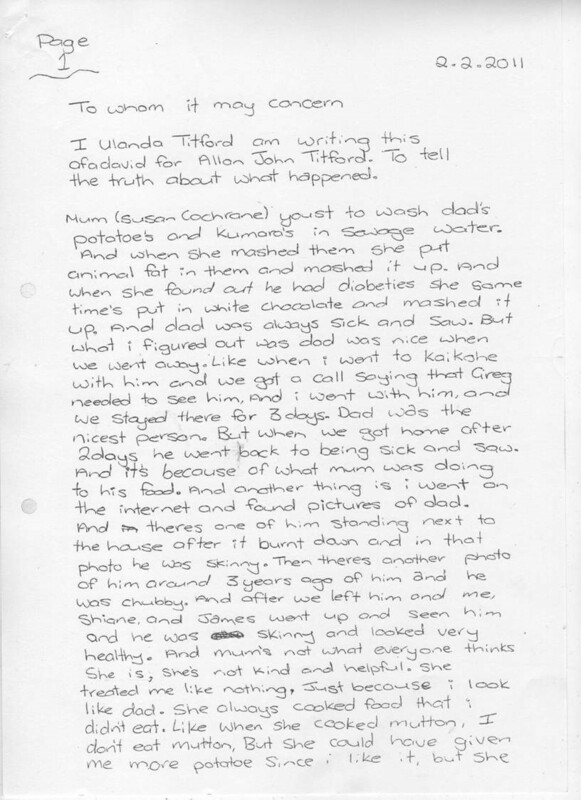 INTERVIEW WITH ILEEN MCGRATH, ALLAN TITFORD’S AUNT, 31ST OF DECEMBER 2013. On the 31st of December 2013, I phoned Ileen McGrath, Allan Titfords’s aunt, and arranged to drop off a package of papers to her. 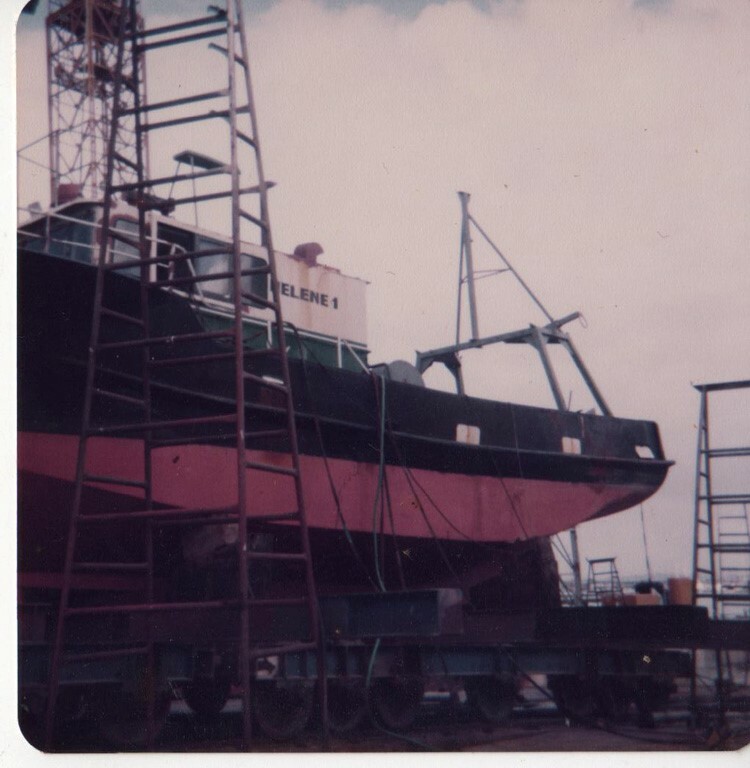 I had contacted her the day before to discuss the visit I had with her nephew, Allan John Titford, at Mt. Eden Prison the previous Sunday afternoon. 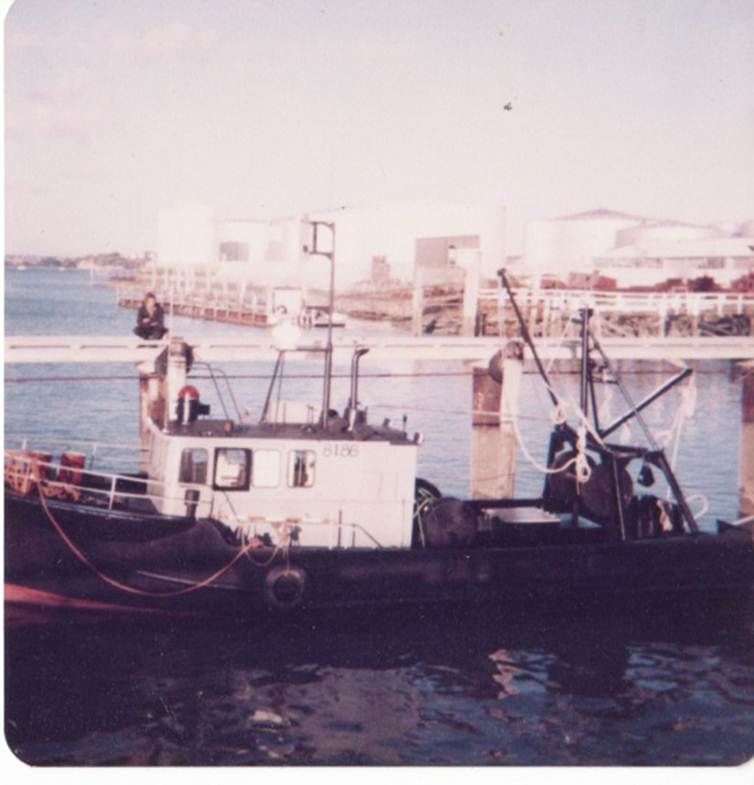 In the course of that earlier 30th of December 2013 phone call I had expressed my impression that it seemed highly likely to me that the 4th of July 1992 arson of the Titford farm home at Maunganui Bluff might have been done by Susan Titford’s father. 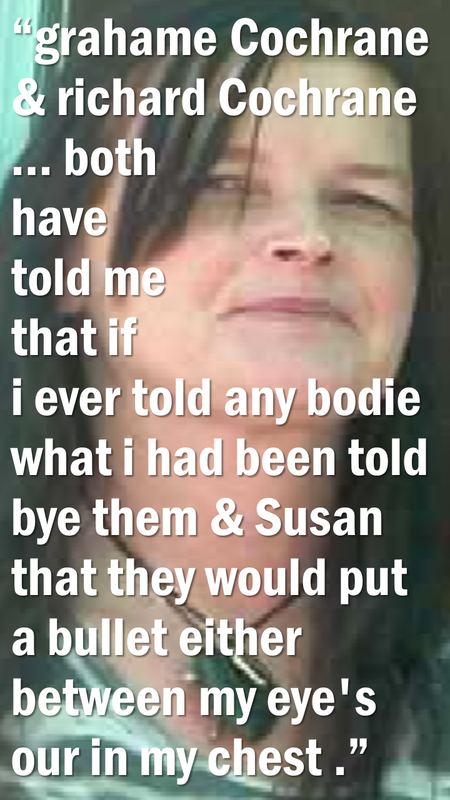 This suspicion had been aroused in reading letters or reports by Susan at the time, which indicated her intense fear of the Te Roroa Maori terrorists and their death threats or on-going intimidation of both Allan and her. It appeared very likely that Susan’s father, Graham Cochrane, strongly-desired to remove Susan from the very threatening environment, at all cost, and considered that the best way to accomplish this was by destroying the home to force eviction from the property under siege. In stating my suspicions to Ileen McGrath by phone on the 30th of December 2013, she immediately said she had information, along the same lines, that she would not discuss on the phone, but would share with me when I dropped off the package of papers. 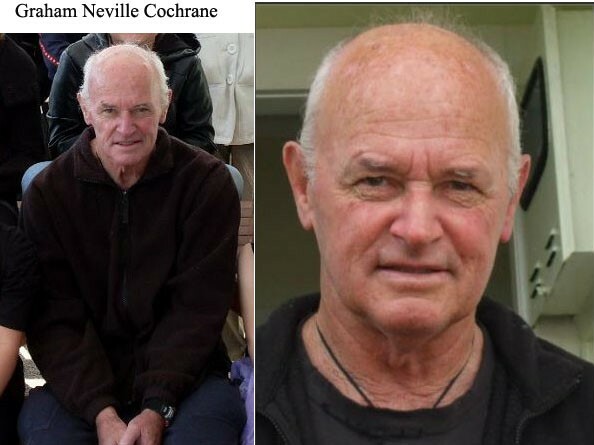 When Susan Titford’s father, Graham Cochrane died on the 16th of August 2011, Sheryll Titford, wife of Brian Titford of Waiwera, Allan Titford’s brother, went up to visit the family the day before the funeral. 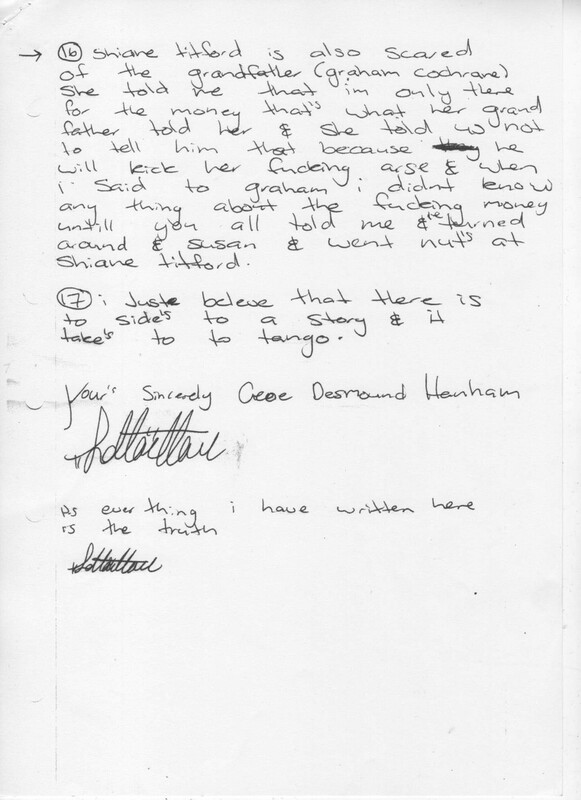 Sheryll Titford was a close friend and confidant of Susan Titford (née Cochrane) and was belligerent towards Allan Titford, as was Brian Titford, Sheryll’s husband. At this family gathering or wake, Susan, very distraught and in the company of Alyssa and James, approached Sheryll and told her that Graham Cochrane had made a deathbed confession that he had burnt down the home at Maunganui Bluff in 1992. About a week after Graham Cochrane’s funeral, Ileen McGrath attended a family BBQ at Waiwera and washed dishes afterwards with Sheryll. Sheryll appeared to have a bottled-up need to share the very important revelation from Susan with Ileen and, although Sheryll remained contemptuous in her attitude towards Allan, but loyal to Susan, she was in a quandary as to what she should do with this very significant knowledge. 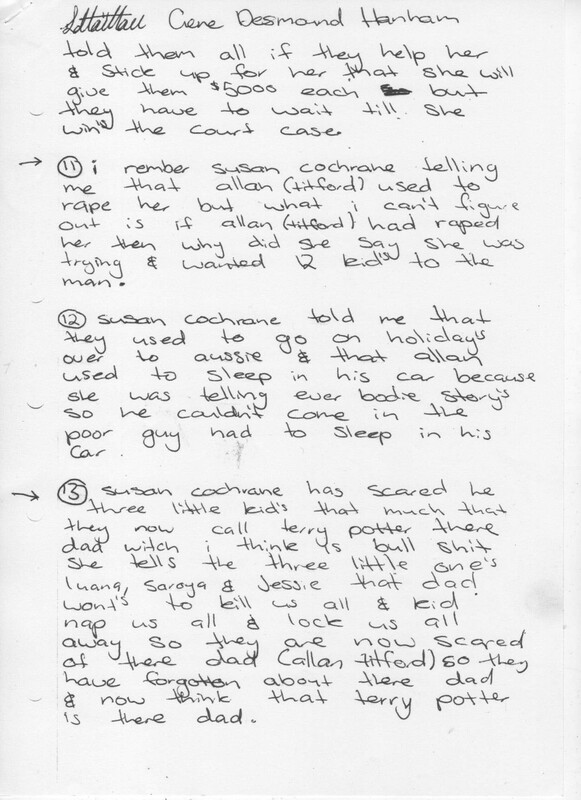 Ileen McGrath told Sheryll that she should “do the right thing” and disclose the information to the police. At a later, unknown, date Sheryll phoned Ileen to say “It’s done”. 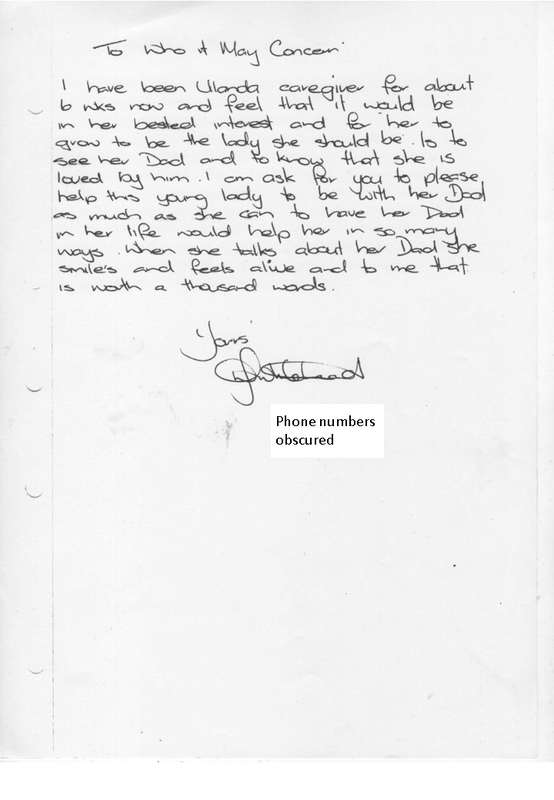 Sheryll then recounted how she’d transmitted this information to Detective Eddie Evans, the individual handling Titford’s files and the one designated to provide Allan Titford with full police disclosure. Despite having this pertinent and highly significant information in his possession before Allan Titford was sentenced, accompanied by a legal obligation to disclose it to Allan, Detective Eddie Evans withheld this from the court. As a result of this omission, Allan Titford was subsequently convicted of arson, even though the police knew he was innocent of the charge before sentencing occurred. Also, during the 2013 trial and before sentencing, Ileen McGrath wished to speak with Allan’s legal aid lawyer and tell him what Sheryll had told her, however did not know his name. Allan had told Ileen that his lawyer was Mr. Moloney and that he had offices in Albany. Ileen could not find any such individual in the telephone book, so called barrister Greg Denholm to see if he had contact details. 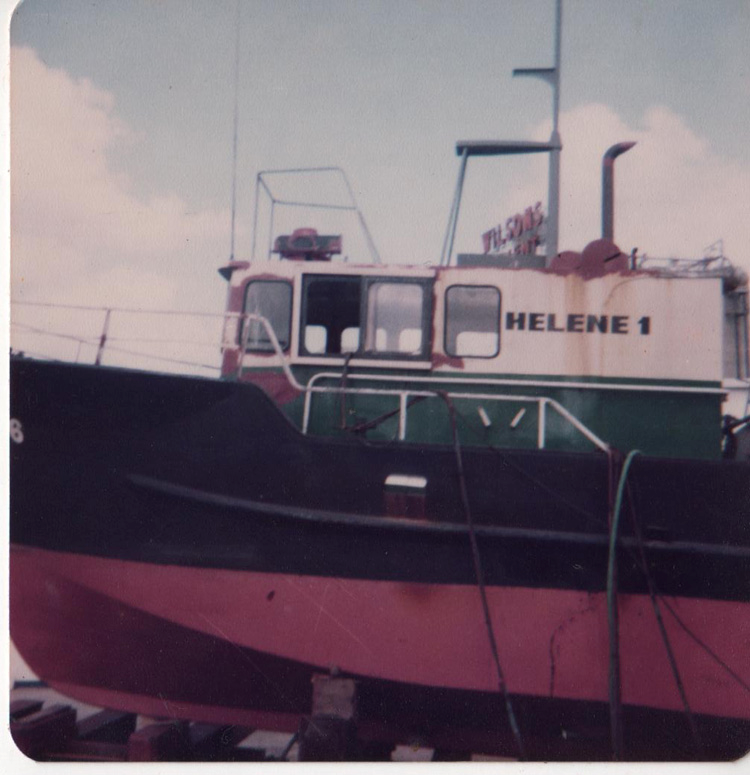 Greg Denholm said to Ileen that the lawyer’s name was Mahoney, but Ileen could find no such reference either, so simply went through the yellow pages to locate lawyers with premises in Albany. 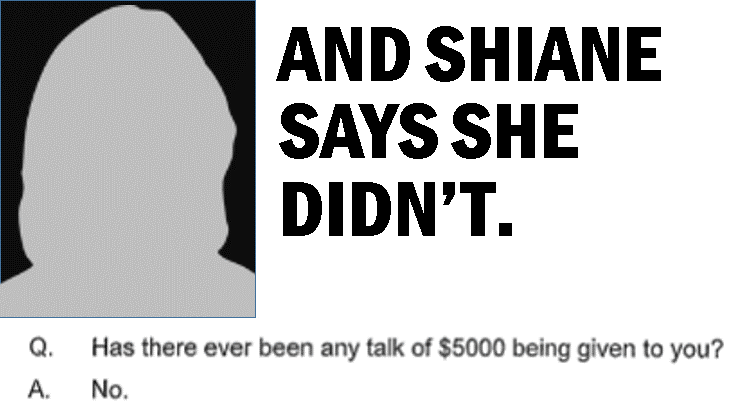 She then found reference to an Albany-based lawyer called Moroney. After verifying that Mr. Moroney was representing Allan Titford, Ileen went down to the premises of the lawyer, situated adjacent to the Albany courthouse, and asked to see Mr. Moroney, but the secretary said he was away. 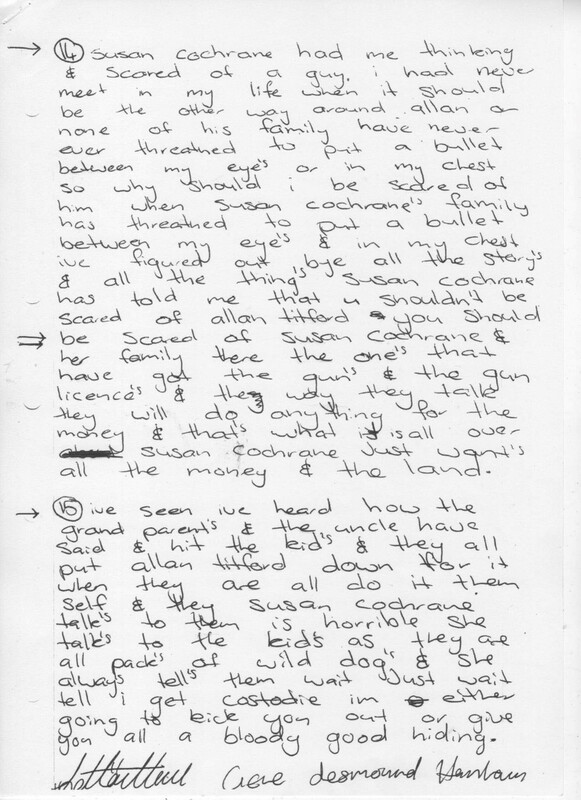 Ileen gave an account of what Sheryll Titford had told her and said that an affidavit (verbal or otherwise) about Graham Cochrane’s deathbed confession had been presented, by Sheryll, to Detective Eddie Evans, who had noted these facts. The secretary said that she knew Eddie Evans very well and would transmit this information to Mr. Moroney. the 4th of July 1992. Ileen McGrath had done all in her power to convey this important information to Allan’s lawyer for use in Allan’s defence. Regardless of this effort, the affidavit by Sheryll Titford was not presented for the court’s consideration, nor were any witnesses of Graham Cochrane’s deathbed confession called for cross-examination. 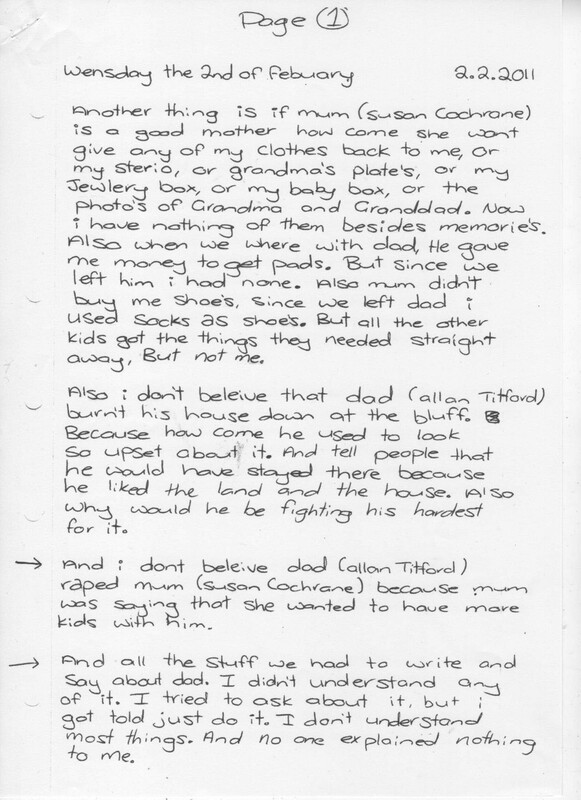 Allan Titford was subsequently convicted of burning down his own home and sentenced accordingly, based upon the known fraudulent testimony of Susan Titford (née Cochrane), who knew first-hand that her father, Graham Cochrane had admitted to being the arsonist. Alyssa and James Titford also knew that their father was innocent of this charge, but deliberately withheld that knowledge from the court. Susan, Alyssa and James have proven themselves to be hostile witnesses who have knowingly committed perjury and whose testimony should not be permissible in a court of law. 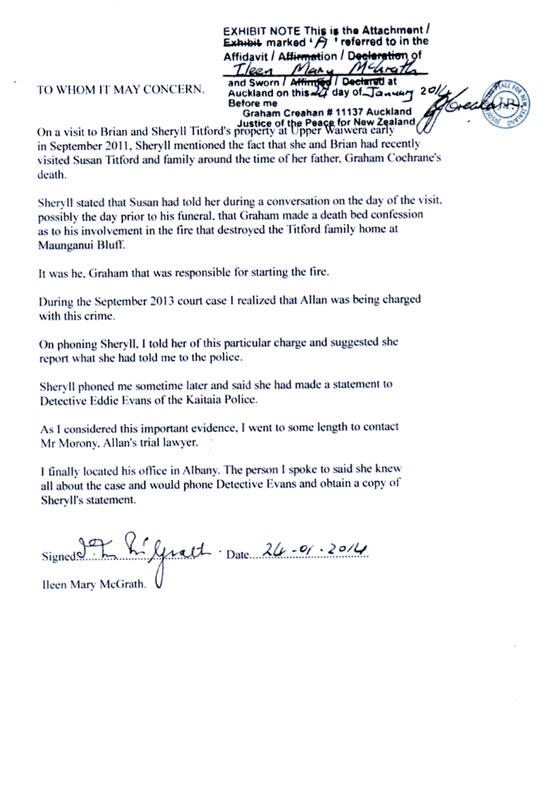 Ileen McGrath prepared her own affidavit concerning what was told to her by Sheryll Titford, as well as their combined attempts to transmit this very important information to the police and court prior to Allan Titford’s sentencing on this false charge. There is much more to come out on this story, specifically about state corruption and collusion with a family of habitual liars. But will a mainstream medium have the guts to run it? 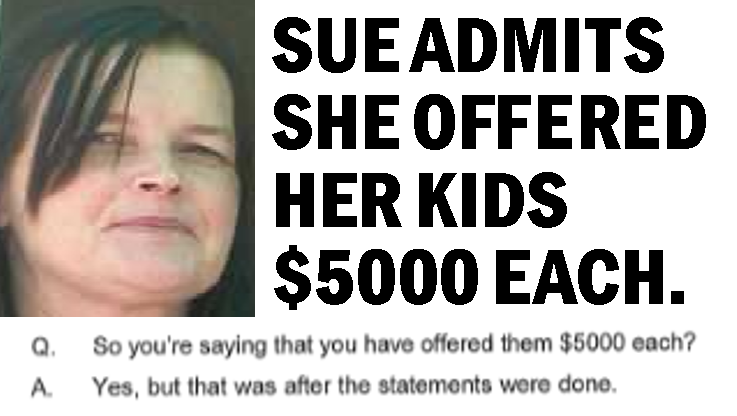 If Sue can lie so brazenly about the arson, what else did she, Alyssa and the other children lie about?